The apartment is located in the heart of Patong, which is one of the most popular tourist places on the Phuket island in Thailand. 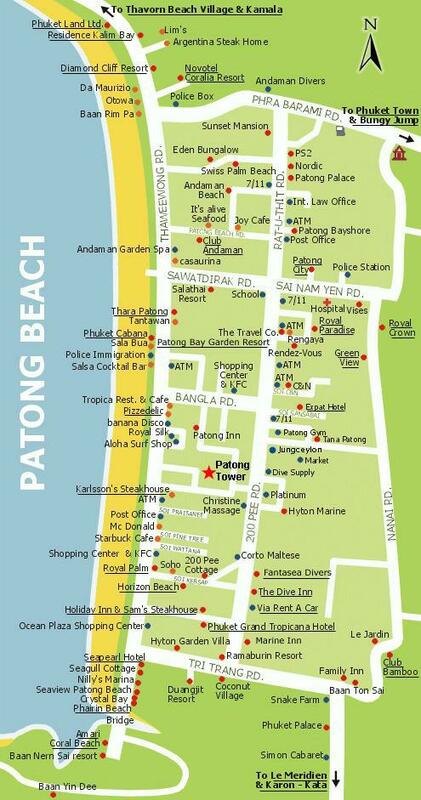 And it is a part of Patong Tower Condominium - the tallest building in Phuket with more than 30 floors. The location is very central, as the distance to the beach, entertainments and shopping amenities is pretty short. First of all there is the direct and short way to the beach. Actually there are 3 ways to go - either along one of the two side streets, or through the cosy restaurant and shopping pedestrian street in the middle, which offers many kind of things such as: Nice and cheap restaurants - like the Swedish Harry’s Steakhouse & Hotel, massage and beauty parlors, tailors, laundry, supermarket, pharmacy and smaller stalls with many goods. 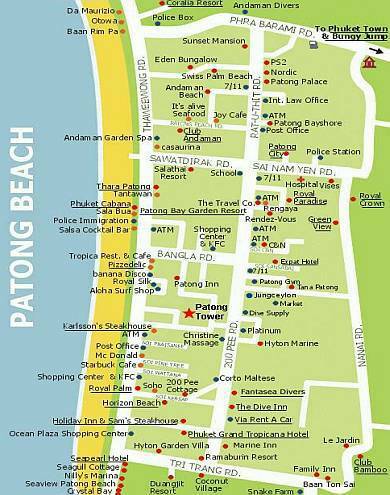 But if you choose to go the opposite direction, you will pass through the Patong Resort area, which gives access to another road (Song Roi Bee Road). This road is parallel to the beach-road, and here you can find the new big spectacular shopping and culture centre Jungceylon. If you instead turn left inside the hotel area, you will reach the little street Soi Patong Resort, which is a side street leading into Bangla Road - the most well known of all streets in Patong, as most people associate it with a delightful nightlife. The side street is characterized by a larger number of Scandinavian restaurants.